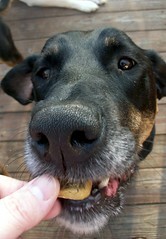 Planet Dog has unleashed a new line of healthy dog treats called, simply enough, eats. The 100% organic baked treats are made in the USA and not only aid in tarter control, but offer super nutrients in every bite! 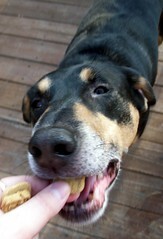 Designed with form, function and versatility in mind, eats are the perfect companion for Planet Dog's Orbee-Tuff toys. They are perforated to easily break into smaller pieces and can fit inside the treat spot of the toys to provide interactive play and wholesome goodness all in one! 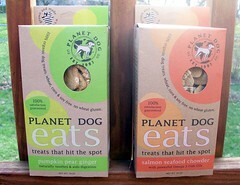 Planet Dog eats are wheat, corn and soy-free and contain no wheat gluten. The rough, crunchy surface supports daily tartar control, contributing to healthy teeth and gums. Currently, eats are available in two varities, Pumpkin Pear Ginger and Salmon Seafood Chowder. The Pumpkin Pear Ginger treats are a great source of dietary fiber, and are packed with vitamins. Pumpkin aids in digestion and it is a natural remedy for stomach ailments, including constipation and mild diarrhea. Ginger is a perennial herb that has potent anti-inflammatory properties, stimulates digestion and enhances the immune system. The Salmon Seafood Chowder treats feature salmon which is rich in minerals and provides an excellent source of high quality protein that contains all essential amino acids. Vitamin E and Omega 3 oils found in the salmon oil help decrease the risk of heart disease. Omega 3 oil can also lower triglycerides and low-density cholesterol in the blood, aid in regulation of blood sugar levels, inhibit tumor growth and lower the risk of cancer. "Consumers are looking for pet products with multiple health benefits and applications," says Stephanie Volo, Planet Dog's President. "By inserting Planet Dog eats into the Treat-Spot of our Orbee-Tuff toys, dog lovers can create an interactive play session and treat dispensing activity that also enhances their pet's well-being," adds Volo. As for how they taste? We have photographic proof of a 16 Paws Up Lapdog Seal of Approval! Keeping in line with their social responsiblity to the planet, eats are sold in a recyclable, 14-ounce virgin craft cardboard box, which certainly compliments the healthy, organic nature of the product. A peek-a-boo window allows consumers to see the treats inside before buying them. 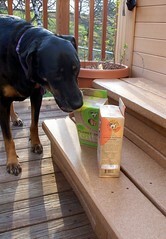 As a big dog Mom, I really appreciate being able to see the size and shape - there's no surprise when you open the box! "We believe in truth in packaging," says Volo. "The box size is compact so consumers can see exactly what they are getting. There is no packaging trick or illusion with the box shape and it does not contain air pockets, fillers or sub standard materials found in other treat packaging," adds Volo. Giveaway!!! 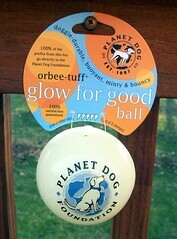 In honor of Earth Day, we are giving away an Orbee-Tuff Glow for Good ball! To enter, leave a comment here telling us what you and your pooch do to celebrate Earth Day or to help reduce your carbon pawprint year round. Receive a bonus entry by posting a link to this review, then email the link to your post to LAPDOGCREATIONS at AOL dot COM! As always, please be sure to leave a means of contact if your email does not automatically attach to your comment. Deadline to enter is Thursday, April 29 at midnight. Sophie says, "BALL!!! Enter now!" I love their packaging. I hate to get home and find treats that are much too big and need to be chopped up, or treats so tiny that the dogs don't realize they ate one. 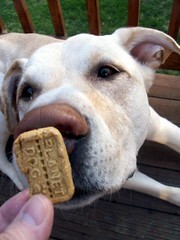 Planet Dog makes great stuff and my dogs tell me that since a glow ball is the prize, I have to post about Earth Day. Love the Lola helping herself shot. Gracie Girl's first ball was a Planet Dog earth ball!! We use a reuseable water bottle instead of buying hundreds of Poland Springs bottles to reduce our waste! 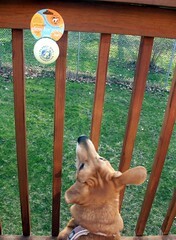 We (Lucy and I)celebrate Earth Day all year round by using recycled tennis balls. My brother's next door neighbor kids throw/hit/whatever a lot of them into his backyard. Sometimes they retrieve them, sometimes they don't. When they don't, he gathers them up and gives them to his favorite furry niece, Lucy. 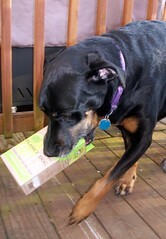 Love the pics...love the one where Lola grabs the box, too cute! We hike a lot and our Weimie daughters, Princess Leia & Sonoma, hike their stuff in with their own backpacks. And on the way out, they get to hike out some trash, like plastic bottles and caps. Last year we all climbed (and cleaned) some 14ers in Colorado and plan to do the same this year. Thanks for having a fun giveaway!! We also love the Planet Dog toys!! My two dogs and I celebrate earth day every day by biking and walking everywhere every day. People think I'm crazy toting dogs behind my bike, but so be it! When Max needs grooming we walk about 7 miles to get to his grooming appointment where they only use organic shampoos and conditioners. When we also go to Petsmart or Petco we take our reusable bag. He usually recycle his toys, when he has a soft toy with a squeaky inside and the toy tears apart, I take the squeaky out and I knit a ball and place the squeaky in and he has a new toy all over again. Sometimes, I reuse the cloth of the original toy and sew up a totally new toy usually a bag since I am not good with anything fancy. Also, we recycle his beds stuffing material and make little stuffed bones for homeless pets. Oh forgot to add, Max specially loves to conserve water and he hates it when I shower him becuase I need to use water to get him clean, don't you love environmentally friendly dogs? I like the new look of your blog. I have a doggie tote bag from the Humane society would you want it? It has dogs all over it. Send me an e mail at my regular e mail if you want it. First of all, Snowball wears a backpack on our daily walks and in addition to the weights that she carries I often add bits of trash and things that we pick up off the bridge that people unfortunately toss out from their cars and always end up in the local stream to try to help out a little. When we go to Flyball practice, I always pack a reusable Nalgene bottle for her water supply. In fact, we started a trend as other teammates were getting annoyed from the lack of trashcans in the practice area to throw away their bottles so I suggested we all get matching bottles with our team logo on them. I hope they come in soon! Keep being awesome Planet Dog! 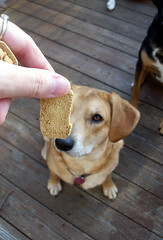 I love watching your dogs get treats, they have such good manners. LOL Are they always like that? :) Super cute photos! I wish I lived closer so I could meet all your pups, I miss having a doggie. Our chihuahuas are environmentally aware as well. We use unmatched stray socks tied in a knot, sometimes stuffed with goodies inside! These treats you speak of seem perfect for these toys. We also recycle our own items and collect trash and recyclables from the sides of the road and near our rivers! We have many very good "rinse an reuse" habits!